A blog about the simple life. Homesteading. Frugal living. Self-sufficient. Sustainability. Homeschooling. Farm Life. Cooking. Canning. Baking. Recipes. Tips & Tricks. Family Life. You will also find tips on prepping and becoming a prepper. We our proud of our Christian faith and will make posts accordingly. Product Reviews! As seen on Extreme Cheapskates! We love to have coconut on hand and one way to ensure you have coconut all year long is by dehydrating it from fresh coconuts. Dehydrated coconut stores so much longer than fresh coconut and goes great into baked goods, such as cakes and cookies. 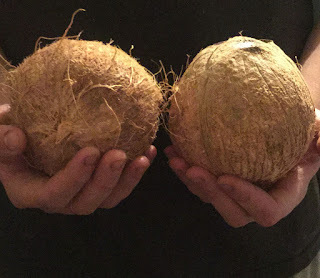 Coconuts also provide a great source of fiber and also contain a good source of protein and folate, as well as Vitamins A & E. It tastes good and adds a nice texture to foods. Coconuts are considered the superhuman food of the food pyramid world. Eating coconut on a regular basis can have very positive effects on your overall health. 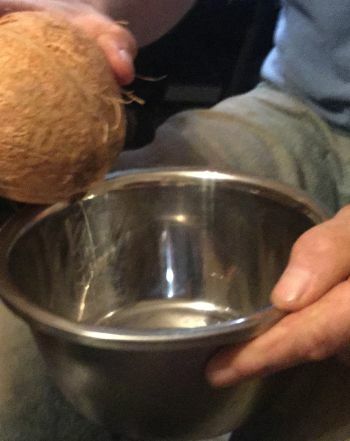 To get the coconut "meat" out, you first have to open the coconut. 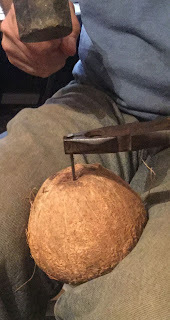 To do so, first hammer a 10 penny nail through each one of the coconuts "eyes". Then drain the liquid out. You can drain it into a bowl and drink it or give it to your chickens. They love it as much as humans do. Now using a hammer, hit the coconut a few choice times and it should crack open and you can now pry out the meat. 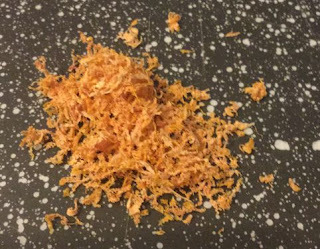 Once all the "meat" is out, I used a cheese shredder to very carefully shred it. 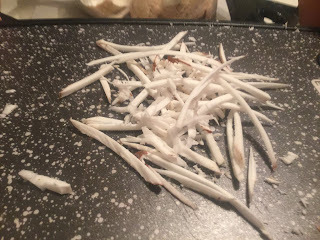 Now just place the coconut on your dehydrator tray at 135 degrees and dehydrate for about 8 hours . 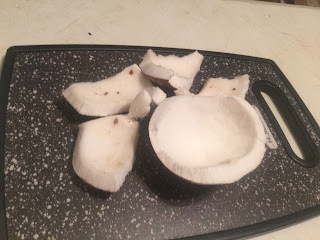 If you want your coconut sweetened, just sprinkle some sugar on it before dehydrating it. 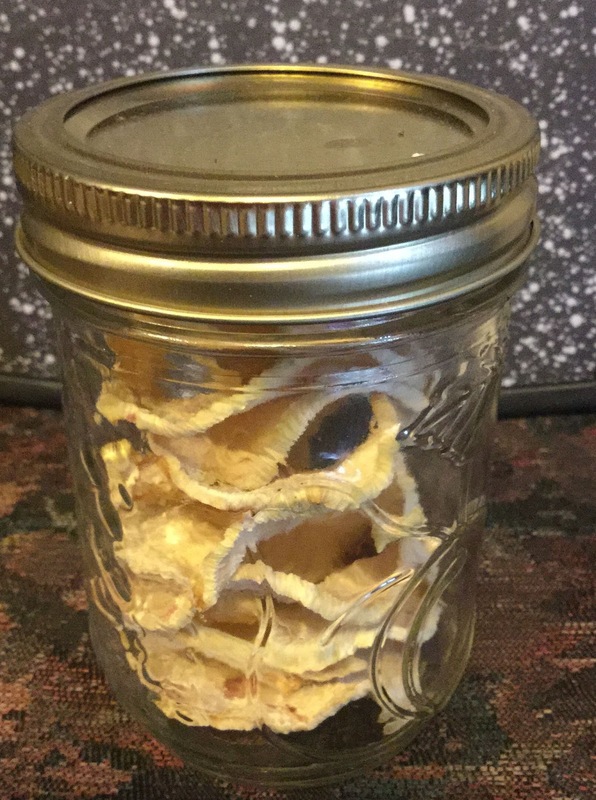 Once dried store in a sealed mason jar until you are ready to use it. I have stored it up to 2 months with no problems. I am sure it would last longer than this but only have experience up to 2 months. We enjoy it too much. It makes a great snack straight out of the jar or you can add it into any recipe or add it into a homemade trail mix. It is also awesome sprinkled onto ice cream or a salad. I also like to dehydrate Easter Peeps, Plantains, and Pineapples. It might seem strange to you but I actually dehydrate not only bananas but I also dehydrate the banana peels. Did you know that a banana peel is as useful as the banana itself? The banana peel contain antibiotic, anti-fungal, and enzymatic properties. Besides that, they are very nutritious. Did you know that banana peels are rich in potassium, calcium and Vitamin D? Well, they are! Banana peels are great for your garden and plants. Put them under your rose bushes to deter aphids. They also help your rose bushes grow big and beautiful because of the potassium. Other plants benefit from banana peels to because of the phosphorous, potassium and other macro-nutrients they provide. Just place small pieces of banana peels into the soil for an added boost. Every time I plant a new seedling I do this and have great results from it. The potassium in the peels helps with root development of plants. It also helps promote stronger plant stems...essentially making your plants more disease resistant, drought resistant, and pest resistant. The calcium is also great for root and stem development. Calcium also helps break down the nitrogen in the soil. Phosphorus helps with seed viability and germination. It is essential for healthy roots and for overall plant strength. Finally, the magnesium in banana peels aids in the production of chlorophyll. In other words, it helps keep your plants green. It also helps to feed your plants. Not only are banana peels great for plants there are other great uses for it too. You can actually eat them too. There are many Asian and Indian recipes that call for banana peels and they can be eaten cooked or raw. It seems weird to us in America but the entire banana is utilized in other countries around the world. You can also juice the peels and add them to a smoothie or other drink to add some extra flavor, vitamins and minerals. To juice the banana peels, just add a few peels to a pot of boiling water and allow them to boil for about 10 minutes. I use one whole banana peel per 2 cups of water. Once 10 minutes have passed, remove the peels, and allow the "juice" to cool and you now have banana juice you can use in your drinks. Finally, you can feed your dehydrated banana peels to your farm animals. I have fed them to my pigs, chickens and rabbits and they all love them. You can feed it to them in chunks or grind them up into a powder and add it to their feed. It is a nice treat and the animals love the taste and they get a bit of nutritional boost too. 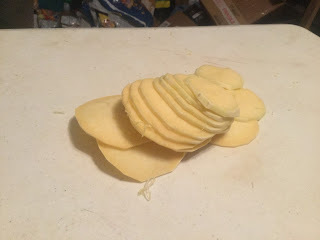 Dehydrating the peels is super easy. Just wash the peels and remove any stickers and all of the wax coating. Lay out on your dehydrator trays and let dry for about 6-8 hours. 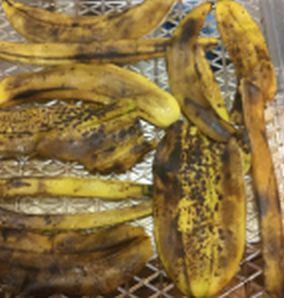 That's all there is too it so the next time you eat a banana, don't toss the peel...dehydrate it instead! I also dehydrate ginger and coffee grounds. My boys love these cookies. 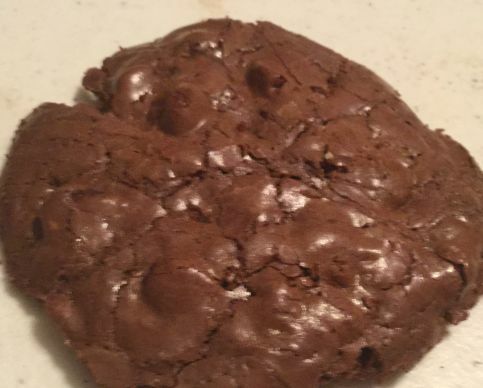 To them, these are "Brownie Cookies" and not "Gluten-free Double Chocolate Cookies" because according to them these taste just like brownies but in cookie form. Whatever you decide to call them, just know they are super delicious. In a large bowl, stir together the powdered sugar, cocoa, cornstarch and salt. Whisk eggs in with the dry mixture. Now stir in vanilla and the chocolate chips. The mixture will be a little runny but it works. Add mixture onto cookie sheet by spoonfuls. 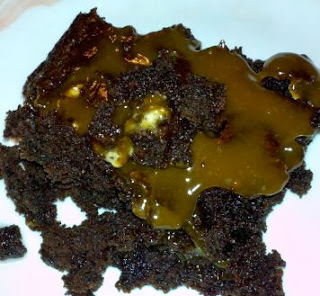 Two other recipes I know you will LOVE are: my Chocolate Cobbler and my Rich, Decadent Caramel Brownies. I have been a member of "Thrive market" for over a year now and really do love the products. They sell organic, non-GMO, natural products at wholesale prices. They sell Paleo, gluten-free, raw and vegan products and they are delivered right to your door at fantastic prices. I especially like their dried green bean snacks. Get free shipping on orders over $49! 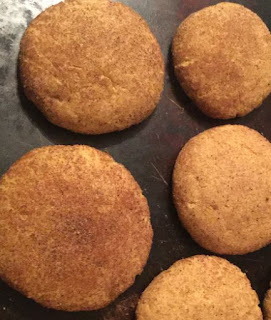 Snickerdoodles is one of my hubbies favorite kinds of cookies and he is almost obsessed with pumpkin flavored anything so I combined the flavors to make "Pumpkin Snickerdoodles". Preheat your oven to 400 degrees. In a large bowl, mix together your butter, shortening, sugars, pumpkin and egg. Once it is well combined, add in the flour, baking powder & soda and the spices. Stir well. Place the bowl in the refrigerator and let it chill for a half hour. As it is chilling, mix together 1/2 c. of sugar, 1 T. of cinnamon and 1/2 tsp. ginger. Once the dough is chilled, remove and form into small balls. Roll each ball into the cinnamon sugar mixture and place on a cookie sheet. Bake for 8 minutes. Be sure to check out my Adaptable Cookie recipe also. Rutabagas are root vegetables and smell (to me at least) like cabbage. It makes sense because rutabagas originated as a cross between cabbage and turnips. The smell can be off-putting but they taste really good. Rutabagas have sulfur-containing antioxidants called "glucosinolates" which are known for reducing the growth of cancerous tumors. They also contain Vitamin C (one serving has over 50% of your RDA) and carotenoids which fight free radicals; in other words, they help prevent the mutation of healthy cells. In doing so, they can improve eyesight and help prevent premature aging. 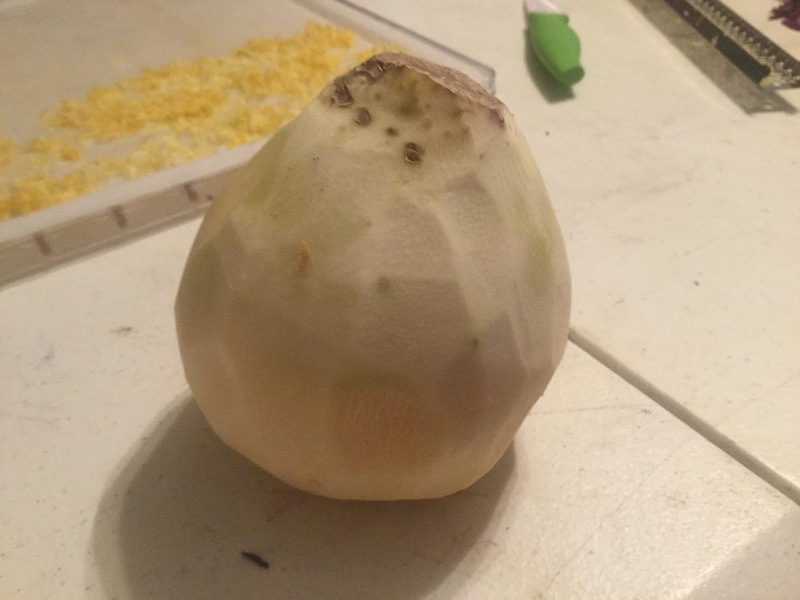 What a neat little vegetable! Rutabagas also contain plenty of fiber and one serving has about 65 calories in it so you can feel good eating them and because they are high in potassium and really low in sodium, it can help lower your blood pressure. Other vitamins that are found in rutabagas in decent amounts include: zinc, magnesium, manganese and phosphorous. All of those help maintain bone tissue. Many people replace potatoes with rutabagas because rutabagas do not have as many carbohydrates. They are a healthier and wiser choice for diabetics because rutabagas have 20% less carbs than potatoes and because of the nutritional values, they are a wiser choice. 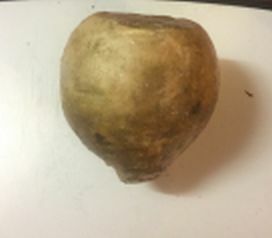 Rutabagas can be eaten raw or cooked. They can be baked, roasted, braised, steamed, stir-fried or boiled. Use them to enhance the flavor of a soup, casserole or stew or serve them as a side dish with about any meal. If using them raw, they can be tossed in a salad. The crunch that dehydrated raw rutabagas provide really garnish your salad. 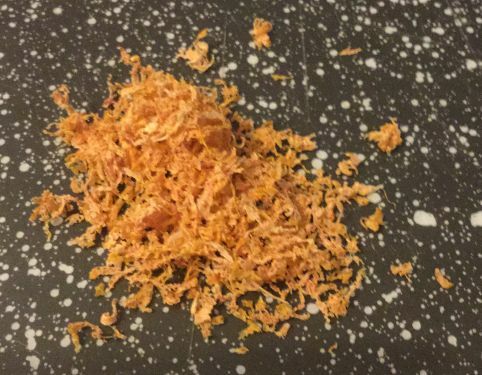 Anyplace you need a bit of crunch for taste texture, dehydrated rutabaga would work. 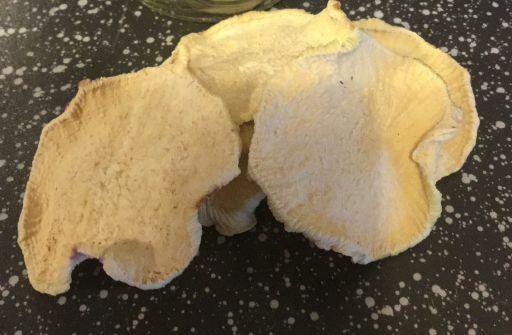 You can cook them and prepare them as you would mashed potatoes but just be sure to always peel them because they are generally waxed so you must peel them before eating. Cook them until soft and serve them with butter, salt & pepper and a dash of nutmeg. The nutmeg really brings out the flavor in rutabaga. 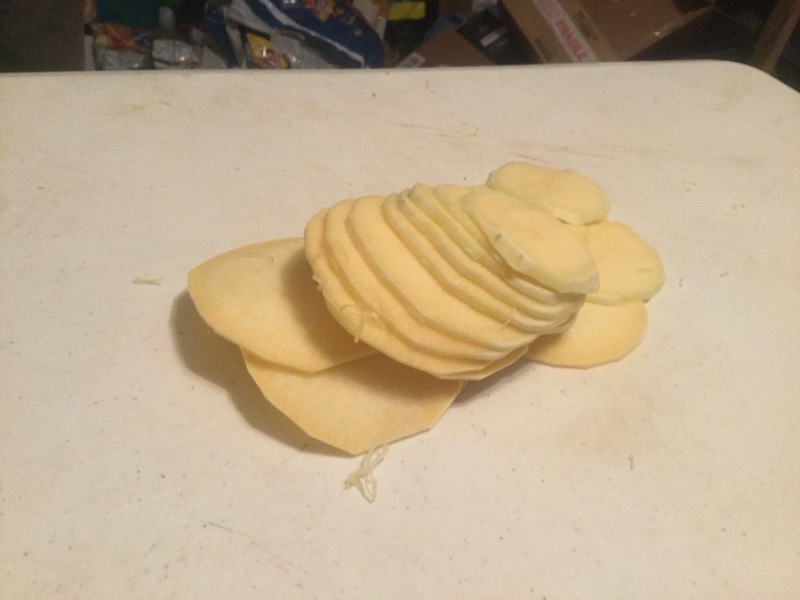 To dehydrate a rutabaga, rinse them well and then peel them. Using a mandolin or sharp knife (please be careful), slice the rutabaga about 1/8" thick. Turn on your dehydrator to 135 degrees and let them dehydrate 10-12 hours. I generally turn them on before I go to bed and they are ready the next morning. When completely dehydrated, they are nice and crisp. Some people eat them straight out of the dehydrator as a vegetable chip or you can place them in a mason jar to be used at a later time. 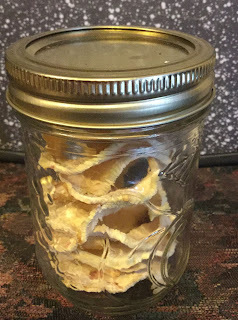 Rutabaga chips in a mason jar ready for storage. Mix together the Bisquick, 1/4 c. of the sugar, and 1 tsp. of cinnamon. Now, stir in the applesauce, milk, egg, and oil until it is well mixed. 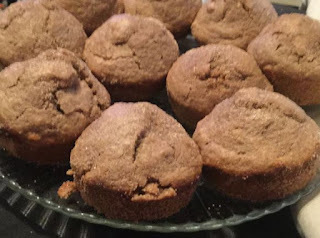 Spray or grease muffin tins and fill each spot 2/3 full of the mixture. Bake in a preheated 400 degree oven for 10 minutes. As it bakes, mix the remaining sugar and cinnamon together. When the muffins are done, and while they are still hot, roll the "puffs" in the cinnamon sugar mixture. Allow to cool slightly and then enjoy! Preserving citrus fruits is not the easiest thing to do or doesn't produce the best results. I found that dehydrating it is the best method. By dehydrating it, you get the actual closest thing to the natural state of the lemon. 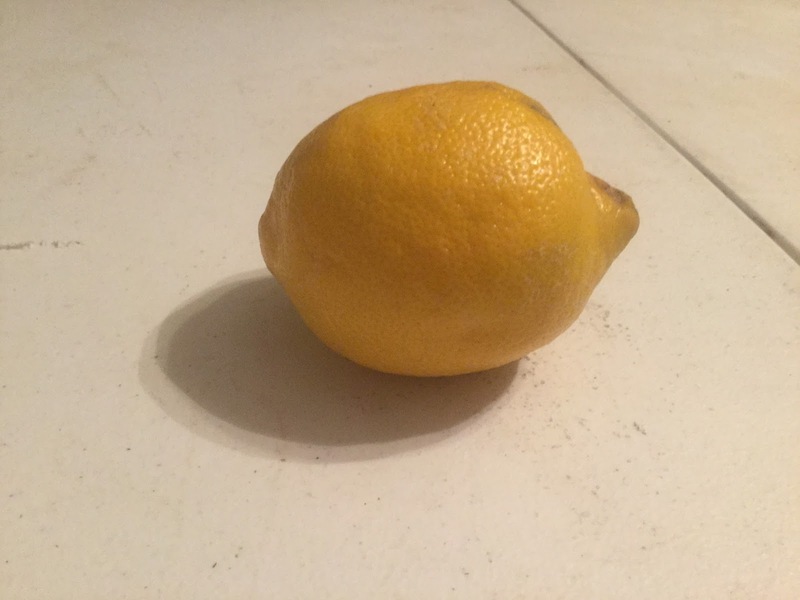 Lemons are high in Vitamin C and Vitamin A and they are also a good source of Potassium and Calcium. 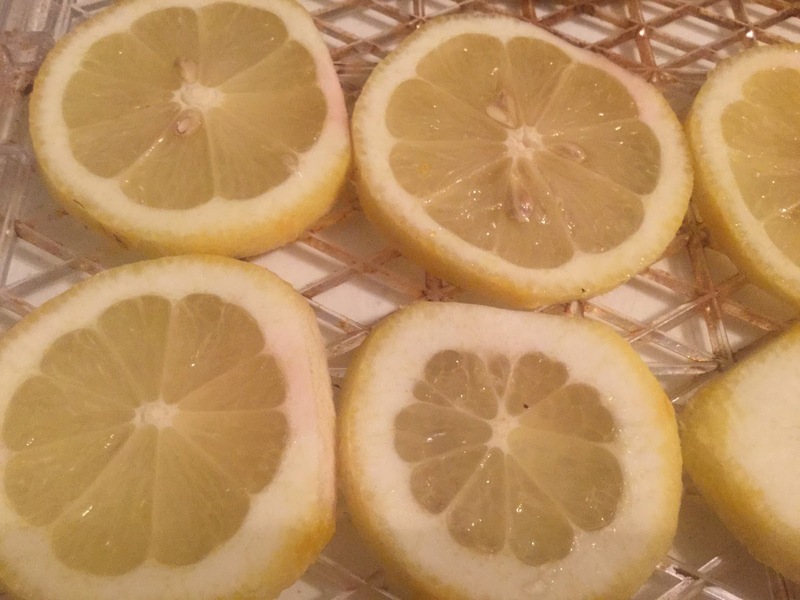 To dehydrate lemons, wash the skin thoroughly. If you plan on dehydrating the zest (skin) then use a zester and do that now. Now just slice your lemon with a knife or mandolin and lay the pieces out on your dehydrator trays. Dehydrate for 10-12 hours at 125 degrees. When they are done, they will be light and brittle. 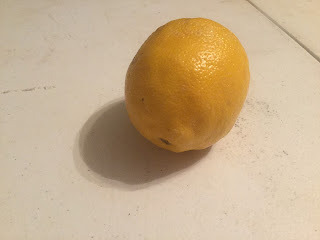 Dehydrated lemon goes great in water, tea or lemonade. The zest can be ground up and made into citrus powder. The citrus powder can be used to flavor drinks, desserts, soups, salads, etc. 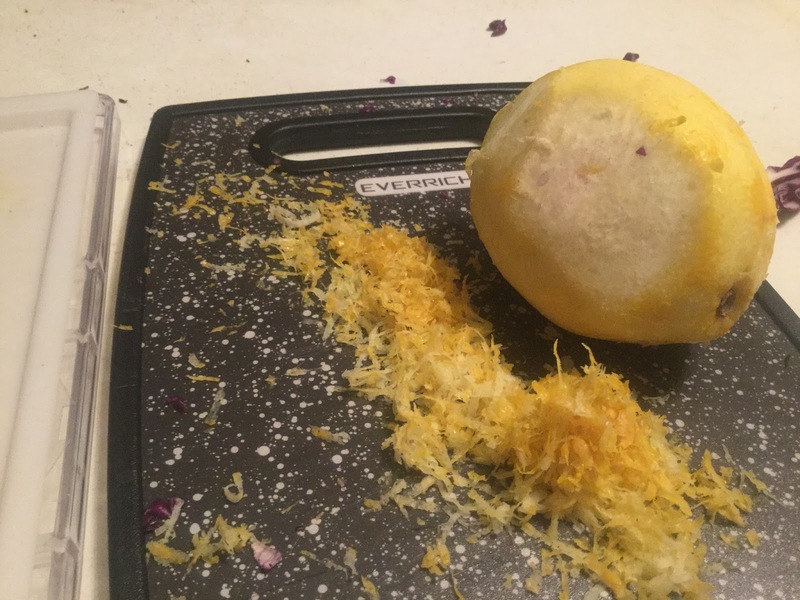 or make a citrus cleaner out of it. 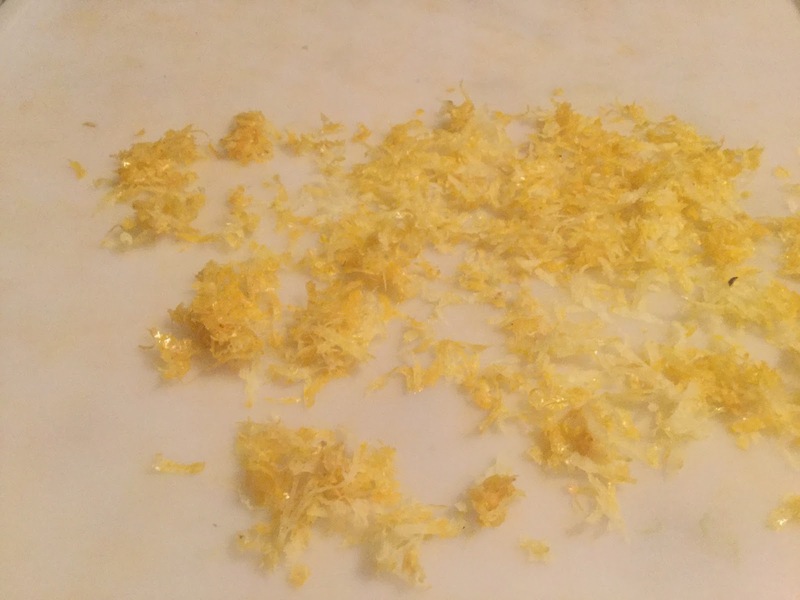 Dehydrated lemon zest. You can grind it into powder or leave it in this form. 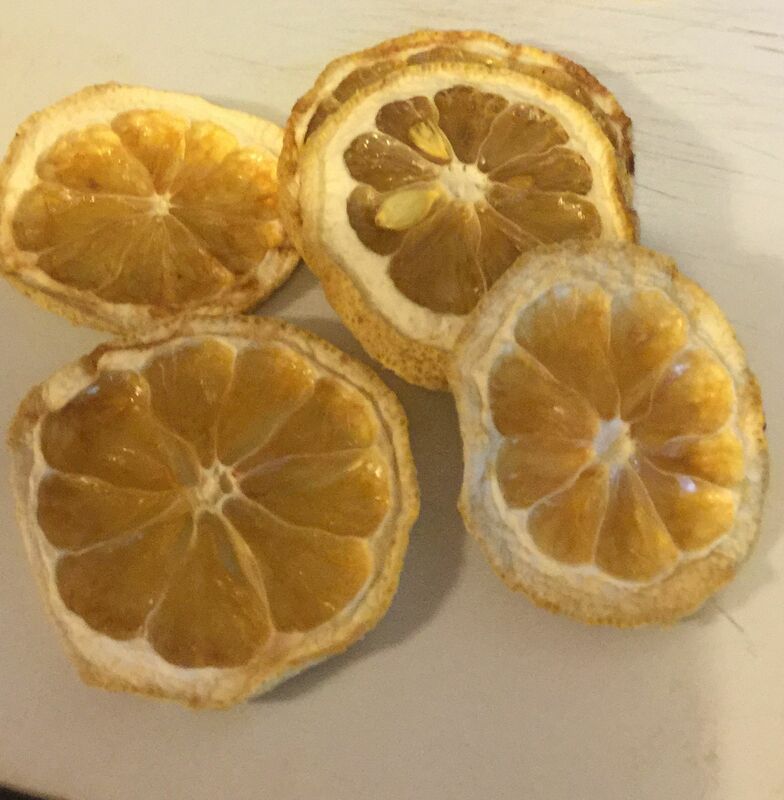 Be sure to check out my post on making Citrus Powder by Dehydrating Red Pomelo Grapefruit! 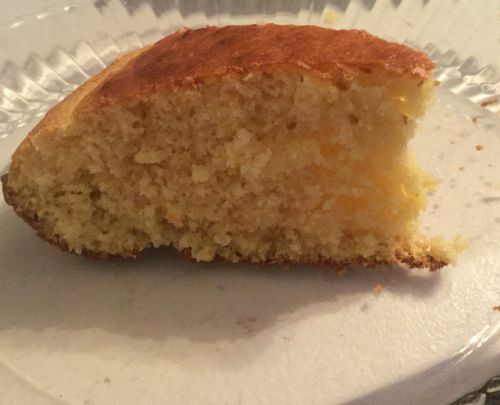 The BEST cornbread in the world is made in a cast iron skillet. It makes all the difference in the world. We try to make this a few times a week and there is never any left over. We eat it all. It is great with meals and we often eat it as a snack. Preheat the oven to 425 degrees. Place your 9" cast iron skillet in the oven to warm it up. 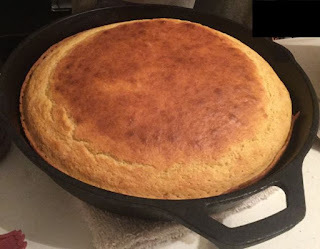 It is important that the skillet is nice and warm first so that the cornbread cooks evenly. In a small bowl, mix together the buttermilk and cornmeal. Let it soak for 10 minutes. In another bowl, sift the flour and stir in the sugar, baking powder, baking soda and salt. 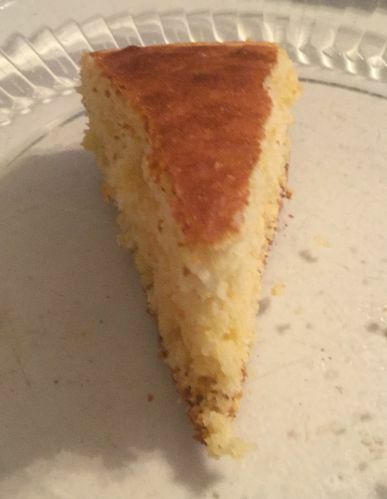 Beat in the cornmeal mixture, eggs, and butter. Stir until you have a smooth batter. Remove the skillet from the oven (careful it will be hot) and pour the oil into the skillet and make sure it is coated well. Pour off the excess. 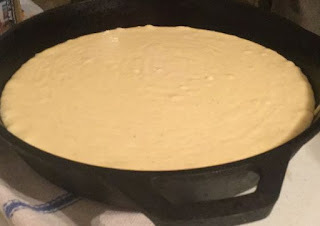 Now, pour the batter into the cast iron skillet. The cornbread batter in the cast iron skillet. Bake for 18-20 minutes. It is done when a toothpick is inserted and comes out clean. Cut into wedges to serve. This cornbread goes so good with Homemade Tomato Soup, Smoke Sausage & Radiatore Soup, a big pot of Southern Beans and Ham, or even Chili! 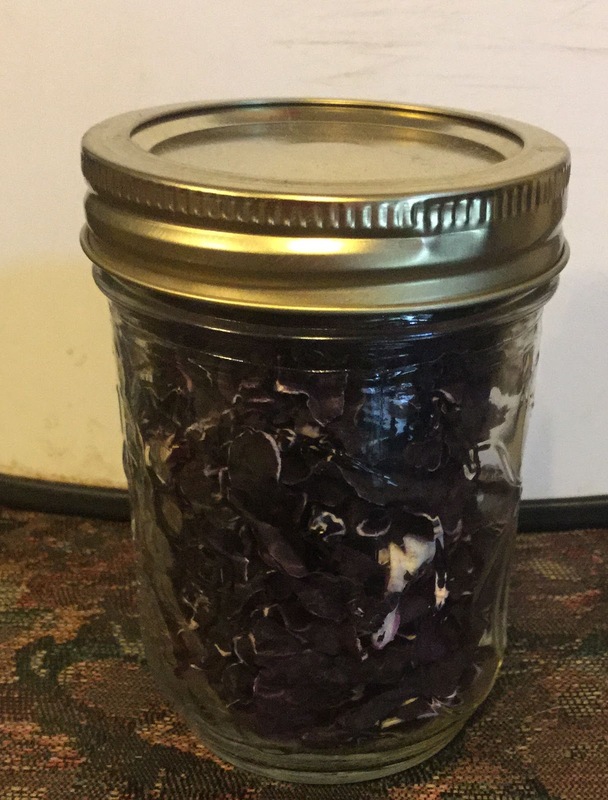 I harvested a lot of purple cabbage from our garden this year and it was just too much to eat it all so I decided to preserve by dehydrating it. 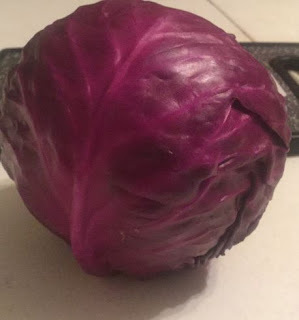 Yes, some people call it red cabbage but since it is purple, I call it purple cabbage. Purple cabbage is so good dehydrated. It not only preserves the cabbage and its shelf life but dehydrated cabbage makes a great snack. Each little flake just explodes with flavor and it smells incredible. It rehydrates easily, cooks well and is so easy to store. To me, dehydrated cabbage is a must for any kitchen! 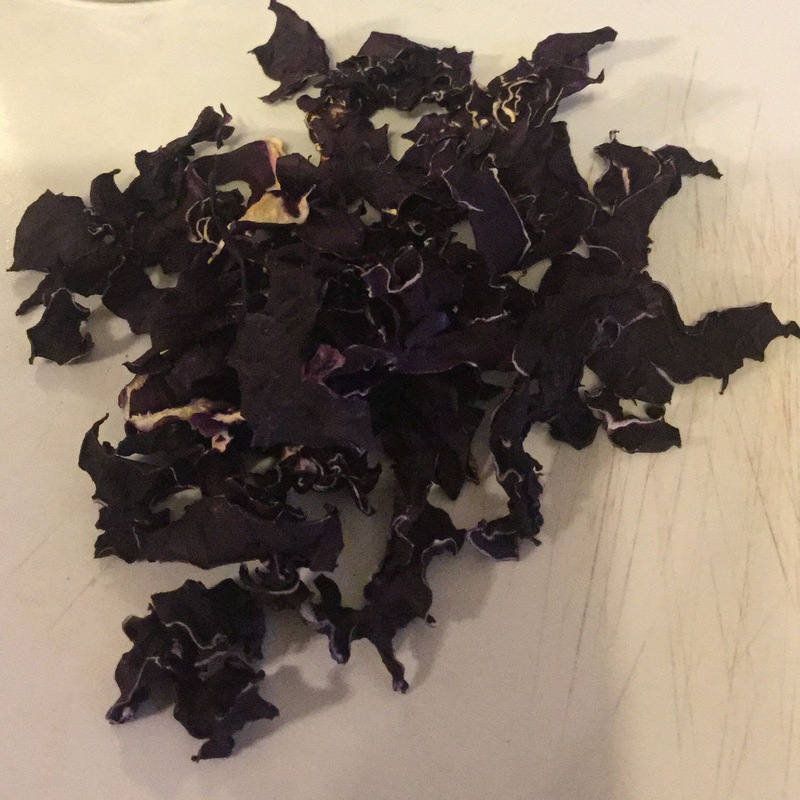 Purple cabbage is low in calories. It also is a vitamin powerhouse being a great source of Vitamin A, Vitamin K, and Folate. It also a great source of Potassium and is a good source of Calcium (80% of your RDA), Phosphorous and the trace minerals Selenium, Zinc, and Manganese. It also contains Omega 6 fatty acids. They have glucosinolates in them also which are a natural anti-inflammatory substance that are key to good health. 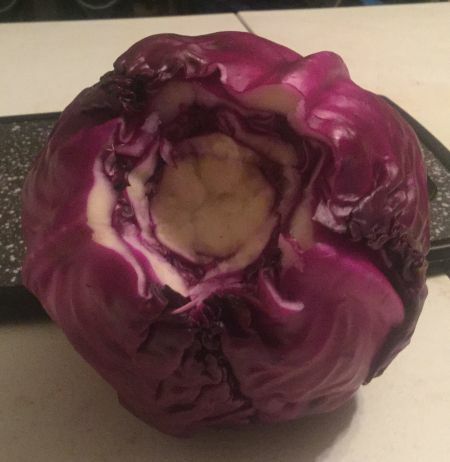 Be sure to not boil the cabbage when you use it. When you boil it the water will sap out the nutrients. Sautéing it is the best way to use it and will be usable for most dishes this way. It is super easy to dehydrate. 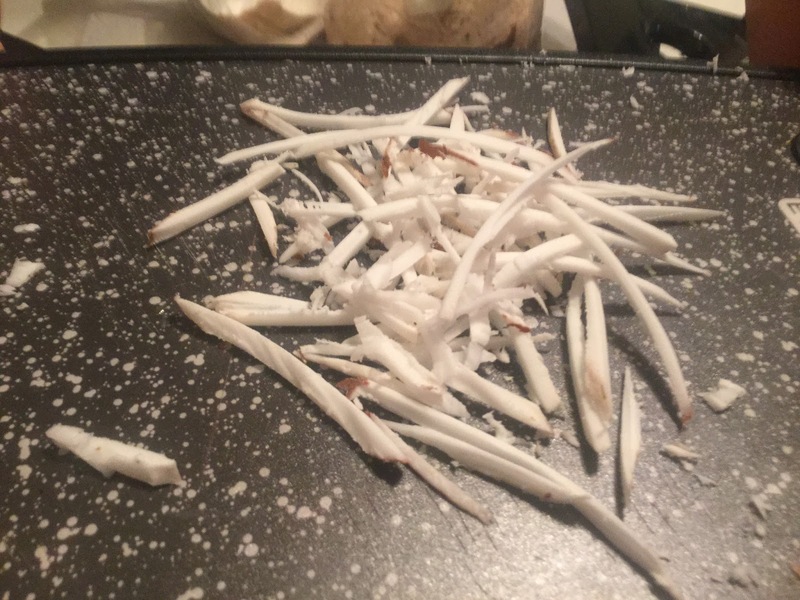 Just pull off the outer leaves and discard. Stem and core the cabbage. Cabbage after the stem was removed. Still need to core it. 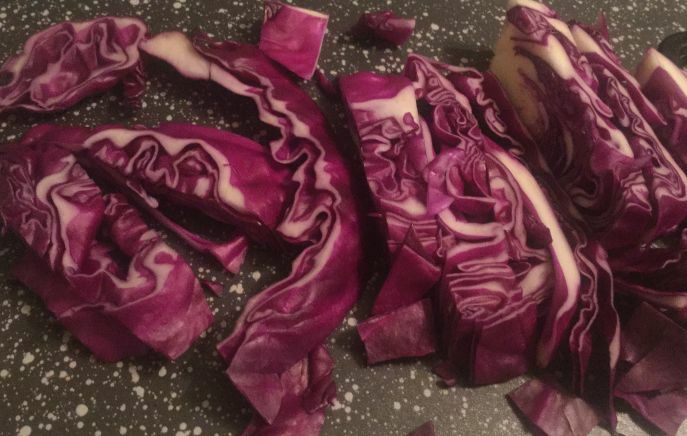 Rinse the cabbage and begin slicing it up as you would if you were making coleslaw. Now, put the cabbage on your dehydrator tray. Turn on the dehydrator to 125 degrees. Let it dry for about 8-10 hours. I generally just turn on my dehydrator when I go to bed and it is done in the morning. When done, the cabbage will be brittle to the touch. 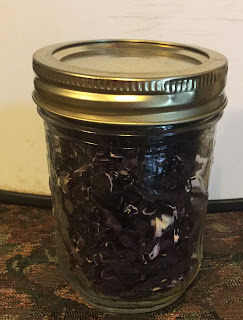 Store your dehydrated cabbage in a mason jar. Jar full of dehydrated cabbage. There are many uses for dehydrated cabbage. It rehydrates very quickly and if your recipe contains plenty of liquid, you don’t even have to rehydrate it before adding it in. I toss mine into casseroles, soups and stews. They add some lovely color, nutrition, flavor and texture to soups and stews. If you plan on making a coleslaw, just soak the dried cabbage in warm water for about 10 minutes and then strain and use it as you would use fresh cabbage. Animals love dehydrated cabbage too. We feed some to our dogs and our goats as a treat and they can’t seem to get enough of them. Dry some today and you will love it as much as we do! I have been cooking for over 30 years, homeschooling for 15 years, prepping for 16 years and homesteading for 7 years. I like to write about my personal experiences. My topics will cover family life, parenting, recipes, tips & tricks, homeschooling, homesteading, prepping, sustainability, and more. I have MS and my youngest son is autistic. Frugal Living: Living off of $1300 a month! 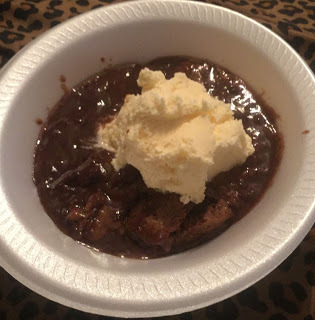 Visit Countrified Hicks's profile on Pinterest. How much money is your blog worth? Theme images by kevinruss. Powered by Blogger.